When all is said and done, the NFL is a business. And like any employee, players want to get paid what they’re worth. The NFL offseason has brought numerous mega-signings for quarterbacks Drew Brees, Kirk Cousins and Sam Bradford as well as Jimmy Graham, Richard Sherman and Malcolm Butler. But a number of other big-name players are still left waiting on their lucrative payday. Here, we look at the most notable contract holdouts heading into training camp and where they stand. The running back and the Steelers have had their contract problems in the past. The team used the franchise tag on Bell for the second straight year this offseason, which has prompted him to repeat his stance from last year in which he sat out workouts and training camp until signing the tender before the start of the regular season. But Bell has expressed optimism about getting a long-term deal done so he can join his team, adding that he doesn’t want to have “replications of what happened last year” when his stats dipped early on. Bell, who finished third among all rushers with 1,291 yards last season, would play for $14.5 million under the tag but is chasing a deal worth $17 million annually. The two sides have until July 16 to find some middle ground. Falcons coach Dan Quinn kept the faith of fans alive when he said he remained hopeful the wide receiver would negotiate a new contract in time for training camp, but a deal has not been finalized and the clock is still ticking. 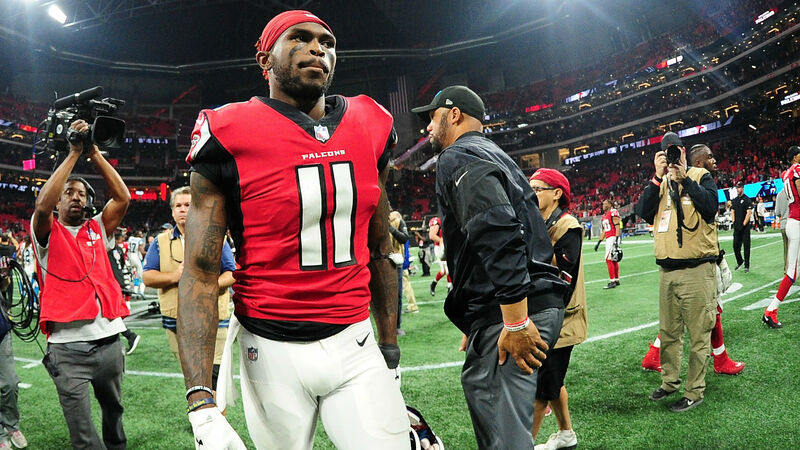 Jones ranked second among all receivers with 1,444 yards last season and said he wants to continue his legacy in Atlanta for the remainder of his career. However, he informed the team before the start of offseason workouts that the five-year deal worth $71.26 million he signed in 2015 is not enough. He even removed all Falcons references from his social media accounts. The free safety has vowed to skip training camp until the Seahawks give him a new contract, though the end for him in Seattle could be inevitable. Reports suggested Thomas potentially going to the Cowboys “still is in play” and the six-time Pro Bowl selection fueled the fire last week when he liked an Instagram post that suggested he could be headed to Dallas. Thomas has spent his entire eight-year career with the Seahawks but has admitted to coveting the young Cowboys squad led by Dak Prescott and Ezekiel Elliott. Thomas, the last founding member of the Legion of Boom, is in the final year of a four-year contract worth $40 million signed in 2014. For the second straight year, the Rams have been hesitant to give the defensive end the contract he’s longing for. Donald skipped training camp last year as he pushed for a new deal and is now in the final year of his rookie contract, where he’s scheduled to make $6.89 million. The Rams have been adamant about wanting to sign him to a long-term deal, but can also place the franchise tag on him if they don’t reach an agreement by next season. Donald has undoubtedly earned a pay out after racking up 11 sacks, five forced fumbles and a league-leading 91 pressures en route to Defensive Player of the Year honors last season.